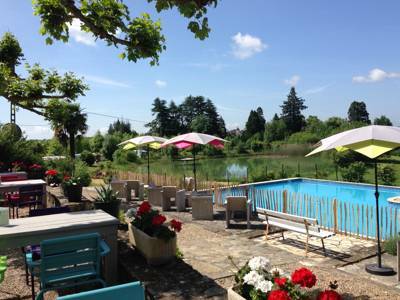 A relaxed Dordogne campsite with a swimming pool, a swimming lake and a family-friendly atmosphere. 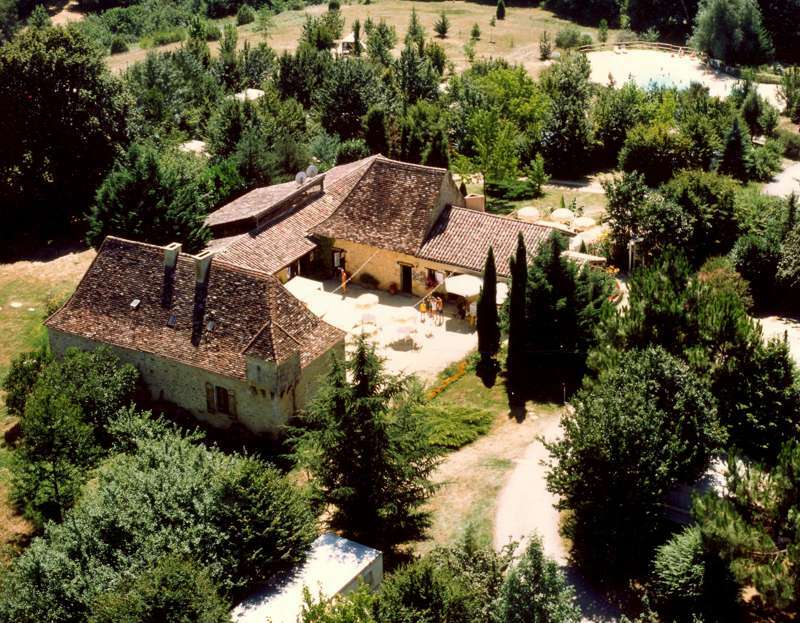 La Brugère, in the heart of the Dordogne region, is a farm. Or so René and Lieke like to tell us. They gesture to the sheep in the neighbouring field, gnawing the grass back to its brown, sun-dried stems, and the cattle dotting a meadow in the bottom of the valley. It’s a working farm, with real life crops, and tractors and ducks and things. Yet despite its early days as a mere side-note to the agricultural proceedings, it’s the campsite that has since become the real centerpiece of La Brugère. And who would have betted otherwise? After all, what kind of farm has a kidney bean shaped lake that’s just asking to be swam in? Perfectly placed trees that are just asking to be pitched under? And sheds with old haylofts that are just aching to be transformed? Yes, La Brugère may claim to be all agricultural and have that rustic, homemade feel but it wears the badge with pride and it’s precisely this authentic, rural nature that makes it so special. The reality is, no matter how much they insist La Brugère is a farm, it’s the camping that’s to die for. Spread in a meadowy space, gently sloping towards the lake at the very bottom, and dotted throughout with young trees, Camping La Brugère is made up of around 25 grass pitches. At the entrance by the yard buildings, a chalky white track leads you in but otherwise the short grass – maintained by those friendly sheep – is left for campers to enjoy. To avoid scorching, campfires are also not allowed, but in the peak season René and Lieke light a communal campfire outside the main farm shed instead, as well as hosting their renowned weekly barbeques – a great communal gathering where campers can socialize; each bringing their own meat and food to cook. The same shed has been delightfully converted inside to be used as a small onsite shop and bar throughout the season. Along with coffee, ice cream, alcoholic and soft drinks, they also serve a few tasty family dishes. Pizza in their wood-fired pizza oven and spit roasted chickens are a staple, while the occasional plat du jour will see paella, fish curry or a confit de canard appearing for a change. It’s an attitude to cooking that’s perfectly suited to the sort of site this is. Casual and spontaneous, yet delighting every camper who’s willing to give it a try. What more could you ask for? 500m away there is a large forest with excellent marked trails and maps at the entrance – you can also ask René and Lieke for some paper copies. The routes are multi-terrain so mountain biking is particularly popular too, though those who want to stick to the roads won't have many problems – the quiet country lanes are ideal for family cycling. For culture, the two nearest towns are Bergerac and Perigueux. The former on the banks of the Dordogne has a picturesque old centre with independent restaurants, cafés and shops, along with a large market on Saturdays. From here you can also rent canoes to paddle on the river – highly recommended – with a pick up arranged after heading downstream. Perigueux is a bigger town. Visit the grand cathedral (+33 5 5353 1063) and the Vesunna prehistoric museum (+33 5 5353 0092). An old cow shed has been transformed into a multi-functional space where the owners run a little campsite bar, open during peak season. In the morning they serve coffees and offer a bread service; you order in the evening and they collect from a bakery in Bergerac each morning. During the day and evening the bar is open for ice creams, coffee, tea, wine, beer and soft drinks. They also serve pizza (made to order) from a wood fire pizza oven, spit roasted chicken (free-range – made to order) and chips (after 7pm). The site hose a weekly grand BBQ offering a great campsite feast – bring your own meat, fish or veg. Elsewhere, there is a restaurant in the village and the nearest supermarket is 12km away. From Perigeux: take the D8 and follow this through Vergt. At the roundabout, about 1km past Vergt, follow the D21 towards Bergerac. After about 7km, there's a petrol station on the right side of the road. Take the 2nd road left (opposite La Brande restaurant). There is a sign for the campsite; keep following the signs for about 6km's to Camping La Brugère.